Actor Dhanush's superhit block buster movie Velai Illa Pattathaari (VIP) sequence version VIP 2, which is directed by Soundarya Rajinikanth. Actress Kajol doing the negative role in this movie, his portion recently completed and return back to Bollywood. 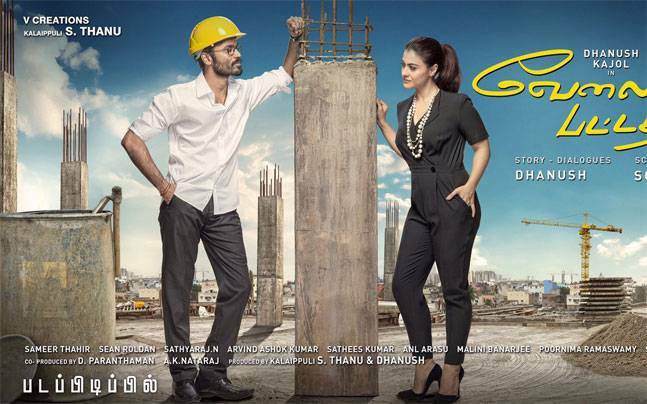 VIP2 movie Dhanush and amala paul doing the lead romantic role, Saranya Ponvannan also doing supporting character in this film. In this movie Kajol doing villain role, this is the very important role in this movie, recently she was posted social media about his portion of shooting was completed successfully. We all very known, Minsaarakanavu Tamil movie, Aravind Swamy and Kajol done the superup performance. after 20 years Kajol is re-entering in the negative character role in Tamil cinema Industry. Kalaipuli S. Thanu and Dhanush are jointly producing this film. VIP2 distribution rights bagged by Dhanush's Wunderbar Films, Sean Roldan doing musical part, cinematography section taking care by Sameer Thahir. VIP 2 story and dialogue were written by Dhanush. Write & Share about "Kajol completed and return back to Bollywood: VIP2 | Velaiilla Pattadhari 2 (VIP 2) Tamil Movie News | Cinema Profile" !